Gen5 production features a nDLC Black Armor Coating on slide and barrel, which is exclusive to the Gen5 models, and a 5.5 pound trigger pull. Glock Marksman barrel with recessed crown and improved right-hand hexagonal rifling. Enlarged reversible magazine catch. Modular backstrap and beavertail system. 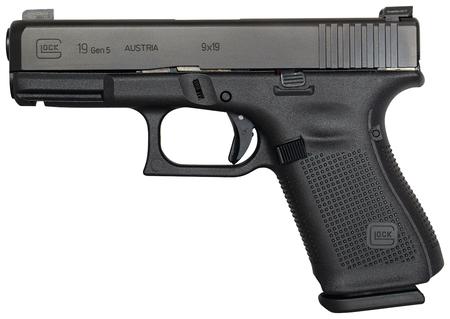 Safe Action system with three safeties: trigger safety, mechanical blocking firing pin safety and drop safety. Steel slide and 4.02 inch Marksman barrel combined with a rough textured frame. Ambidextrous slide stop lever. Natural grip angle without finger grooves and squared trigger guard. Gen5 magazine comes with an orange follower and a floor plate which is extended at the front for faster magazine change. Made in Austria.